Made of a high quality polyester material, our Dura-Poly Acadiana flag measures 3' x 5' and includes vivid colors and an accurate design. The flag is screen-printed on a durable 150 denier shiny polyester material and is finished with a double stitched hem. The flag features a white fabric header with two brass grommets on the 3' side for easy display. The flag is best used indoors but can withstand occasional outdoor use. The authentic design is based on information from official sources. Acadiana, or The Heart of Acadiana, (Cajun French: L'Acadiane) is the official name given to the French Louisiana region that is home to a large Francophone population.In 1965, Thomas J. Arceneaux designed a flag for Acadiana. Arceneaux was a professor at University of Southwestern Louisiana, now University of Louisiana at Lafayette and had derived the flag from the university seal. 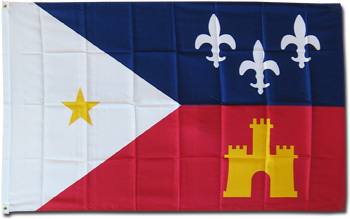 In 1974, the Louisiana legislature officially adopted Arceneaux's design as the official Acadiana flag. The three white fleurs-de-lis on the blue field represent the French heritage of Acadiana, the gold star on the white field symbolizes Saint Mary, Our Lady of the Assumption, patron saint of Acadiana (the star also symbolizes the active participation of the Cajuns in the American Revolution, as soldiers under General Bernardo de GÃ¡lvez, Spanish governor of Louisiana). The gold tower on the red field represents Spain, which governed Louisiana when the Acadians arrived.